You don't always need an expedition-ready kid carrierwhen you prefer something low-profile and lightweight, look to the Kelty TC 2.0 Kid Carrier. Great for errands or shopping, the TC 2.0 also has the comfort features you need for a day hike, like fully padded shoulder straps and a comfortable hip-belt complete with a handy storage pocket. When it's time for your partner to shoulder the load, a torso-length adjustment feature dials in a custom fit. A five-point harness holds your child securely in the padded cockpit. 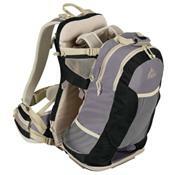 The carrier's extra-large, zip-off cargo pack holds all the essentials and just-in-case items.